A Fishy Dinner, A Tale of 2 Gnocchi, and a Sciatica Soothing Pasta! Three really lovely meals this week, well worthy of a mention! I am writing them up now with the 3rd football match of the day on the TV…. I can’t blame anyone but myself as I have had the control of the remote control!!! The first lovely meal is this…. drizzle the oil over the fish and rub in the turmeric with some salt and pepper. Leave for about half on hour to marinade. heat the oven to 200.
toss the aubergine in some olive oil and salt and pepper, pop on a baking sheet and pop into the oven for 20 mins. in a pan heat some olive oil and fry the onions until soft. Add the cumin and chilli, then add the tomatoes and cook down for 15 mins. Take the Aubergines out of the oven and add to the sauce. Cook all together for 10 mins. fry the cod in a pan on both sides until cooked through and golden. Serve sitting on top of the sauce. It was really tasty, filling and healthy too!!! The following evening it was a tale of 2 gnocchi!!! (Not sure what the plural of gnocchi is?). The gnocchi were bought from La Tua in Borough Market, where I often buy fresh pasta and tortellini. First time for the gnocchi and they were good. On the left, for C were normal gnocchi, with a Carluccio wild boar sauce and some chunky pesto. On the left for me some gnocchi that were bigger and filled with walnuts and Gorgonzola, with a piccante tomato sauce and the same chunky pesto. Really nice, despite me not being a massive gnocchi fan, and a fairly light dinner after a long day. Which leads me onto today. I have not been to work as I have a flair up of the sciatica I had nastily last year. Not as bad, but not pleasant, so looking after myself and being sensible Jo! So… A sciatica soothing pasta was called for! This was really soothing in so many ways, despite being a subtle way of using up bits and bobs of veg in the fridge! Whilst the penne was cooking I sautéed some onion, green pepper, asparagus tips and sweet corn in some olive oil. Once the pasta was cooked I drained it and added it to the veg. To it I added a tbsp of mascarpone and a handful of shropshire blue cheese, with some pepper. I stirred it all together on a low heat until all melded together and gorgeously yummy. So my back is sore, but my tum is full and happy. Surely that’ll get me firmly on the road to recovery?? Firstly a very happy birthday to my lovely sister and Dad, both born on the same day, albeit several years apart!!! Today, an unusual Tuesday day off, all domestics done so a day of pottering around and some tasty food. For my lunch I have made something incredibly healthy, but super lovely! I will dedicate this to the birthday girl…. I think she’d love it. This beautiful plate of food comes from the Madelaine Shaw book ‘Ready, Steady, Glow’. 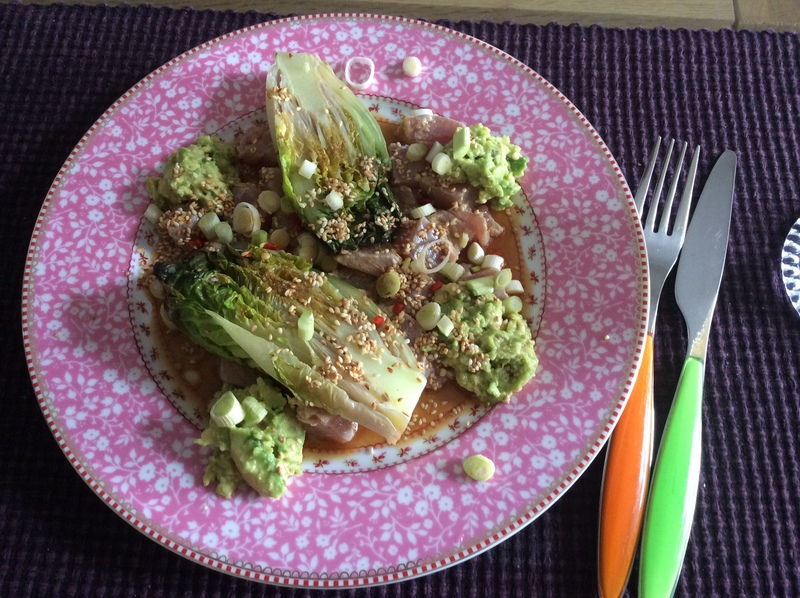 The fresh tuna sat in a little bowl with some fresh ginger, lime juice, soy and sesame oil, while I charred some lettuce and mashed some avocado with some chilli. Sprinkled with some toasted sesame seeds and spring onion for some crunch and red chilli for heat, this was a very vibrant and happy lunch. I am currently writing a little book for a friends upcoming birthday and this will definitely make the cut, with maybe a few minor tweaks. Tonight I am looking at some fish with a spicy aubergine mush….. fingers crossed.